I was born and raised in America, as my parents were before me, yet when I allow myself to think about it, the immigrant experience is well engrained in my DNA. You see, both sets of my grandparents emigrated here from Europe: my father’s family, the Bigas, from Poland; my mother’s family, the Pietramales, from Italy. I always used to kid my folks about their mixed marriage. And so despite my own experience and appearance to the contrary, I am not so very far removed from the newcomer tale, though I was spared all of the struggles of leaving one’s homeland and making it in a new land that my grandparents endured. The following story for The Reader (www.thereader.com) is an attempt to chart the immigrant-refugee landscape in a place like my city, Omaha, and what it looks like to be a newcomer here. You don’t need to look far to find the tired, poor and huddled masses following America’s seductive promise as THE immigrant-refugee haven. With Omaha hosting ever more ethnic minority populations from around the globe, the metro increasingly mirrors the culturally diverse world. Actually observing these newcomers is another matter. That’s because many stay close to their own tight-knit communities. If you want to engage them, you best go where they live, shop, eat or worship. Seen or unseen, they are part of a long, multicultural stream that’s fed Omaha since its 1854 founding. Omaha’s story, like that of America’s, is an ever evolving immigrant flow. “It’s not a static story, it’s a very complex mosaic we have here and it takes a long time to appreciate some of the nuances of it,” says University of Nebraska at Omaha emeritus history professor Bill Pratt. Complicating that mosaic are ethnic-religious tensions within and between certain national groups. Then there are segments of American society that express hostility, suspicion or discrimination toward The Other. Pratt’s UNO emeritus history colleague, Harl Dalstrom, says the immigrant dynamic varies among ethnic communities and the circumstances surrounding them. Nebraska’s foreign-born population increased 31 percent from 2000 to 2008. From 1990 to to 2000 that segment nearly tripled. Latinos, Asians and Africans account for most of the growth. The new groups are mainly concentrated in Omaha and Lincoln. The Omaha Public Schools now serve thousands of refugee students, including more than 1,100 from Burma, Thailand, Sudan and Somalia. One measure of a place’s diversity, says Pratt, is its signs. Omaha’s Eurocentric, English-only commerce now has its Asian, Arabic, African, Spanish counterparts. As low-key as many new immigrants may be, it’s fairly common now to hear their mother tongues and to see their native fashions in public. Events like World Refugee Day and Omaha Heritage Festival celebrate this diversity. Signs and symbols all of Omaha’s maturation into a more cosmopolitan, international city. South Omaha continues its historical role as the city’s primary immigrant gateway and resettlement district. Its affordable housing, blue collar job sector and robust small business climate make it a conducive place to get started. North Omaha and mid-town accommodate growing pockets of immigrants and refugees. For most of its history South O hosted Poles, Czechs, Lithuanians and Germans. Just south of downtown, Sicilians and Calabrese formed Little Italy. There were Jewish, Greek, Chinese and other well-defined ethnic communities as well, each replete with small businesses, most often grocery stores and restaurants. Then, as now, anti-immigrant sentiments peaked during hard times and fell silent during good times. Riots prompted by nativist attitudes erupted in the early 1900s. The south side’s now a largely Latino district whose eateries, food carts and shops are emblazoned with Spanish names. Not that Latinos weren’t there before. They were, just in smaller numbers and almost exclusively tracing their roots to Mexico. “The Mexicans have always been here,” says Arbelaez. Historically, she says, ethnic minorities go undercounted, as their racial identities fall outside census categories and they tend to be highly mobile populations. Plus, the undocumented among them have extra motivation to remain under the radar. Despite the Latino migration that’s transformed the area, remnants of South O’s immigrant past persist in such landmark venues as the Bohemian Cafe, Johnny’s Cafe, Sokol South Omaha and St. Stanislaus Catholic Church. Italian vestiges remain in Orsi’s Bakery, St. Frances Cabrini Catholic Church and Sons of Italy hall. Even though many second, third and fourth generation immigrant groups no longer live in defined ethnic neighborhoods, their heritage festivals continue. Today, the variety of cuisines found in South O extends well beyond Mexican to encompass Guatemalan, Salvadoran and national foods from Central America, South America, Africa and many other parts of the world, too. Exotic eats are no longer confined to South O or the Old Market, as greater Omaha is home to an ever expanding landscape of ethnic dining spots. Then there are ethnic retail stores and other expressions of cultural identity. Inner city health clinics, social service agencies and public schools serve large immigrant bases. It’s much the same way the immigrant story played out a century ago. The story of Early Omaha is inextricably linked to the large European immigrant waves from 1880 through 1920 that helped grow this and nearly every U.S. city and filled the industrial labor pool. The internal migration of African-Americans from the South to the North and their subsequent resettling in places like Omaha also brought an influx of new ethnic-cultural influences and workers. In the aftermath of World War I and the Great Depression and in the first two decades of the Cold War, America grew isolationist, instituting more restrictive immigration policies, and so the steady flow slowed to a trickle. Exceptions were the millions of braceros recruited from Mexico to work in the agricultural, railroad and meatpacking industries and the many displaced persons or refugees from Europe. Omaha welcomed its share of both groups. The heavy tides of new arrivals didn’t begin in earnest again until the mid-1960s, spurred by more open immigration policies. These waves, no longer predominantly European, but Asian, Indian, African and Latin-American, continue today. 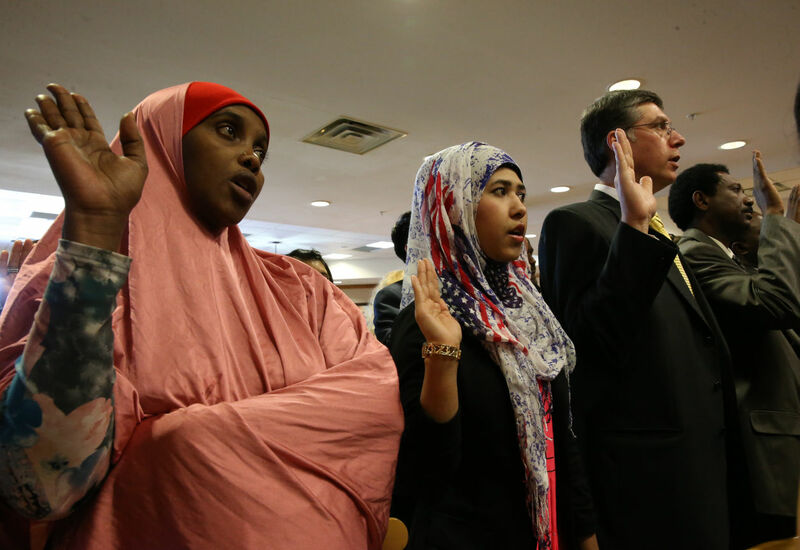 Somalia, the former Burma and Bhutan account for a large number of recent newcomers to Omaha. Each group of asylees fled homelands marred by war and political or religious persecution. A generation earlier, Sudanese escaped similar trauma. As did Soviet Jews before that. In the ‘70s, Vietmanese and Laotian refugees. The surge in Latino immigrants and refugees the past two decades followed economic crises in Mexico and civil wars in Central and South America. Then, as now, Omaha’s home to ethnic enclaves of foreign-born new arrivals and first generation offspring. South Omaha, once a separate municipality, earned the nickname Magic City for a dynamic growth spurt fueled by the railroads, the meatpacking plants, the stockyards, plus all the ancillary services that supported these industries. Large numbers of immigrants lived and worked in South O. The jobs lasted through the 1960s. Many contemporary immigrants and refugees work equivalent jobs in meatpacking and construction as well as in painting, lawn care, cleaning and other service sector fields. Not all newcomers work menial jobs, reminds Arbelaez. Their ranks include professionals, skilled tradespeople, entrepreneurs. Many start micro businesses. Just as opportunity and freedom drew the first waves of immigrants here, they remain enticing beacons of hope for those coming today. Whether propelled by family, economic, political or survival reasons, new arrivals expect and find a higher standard of living and greater liberty here. That doesn’t mean they don’t struggle making it. Most do. Language-cultural hurdles hinder them. Many live near the poverty line. Even basic food staples like rice stretch tight budgets. Then there’s the scarcity of jobs new arrivals traditionally fill. Many of those originating from Third World nations or refugee camps harbor unrealistic expectations for what Sudanese community leader Malakal Goak terms “the heaven” they envision America to be. Invariably, say Goak and local refugee community leaders, reality falls short of these utopian, riches-laden dreams. While Omaha remains an attractive destination or secondary migration site for its relatively low cost of living, healthy job market, good schools and family-friendly environment, it’s not devoid of challenges. Kumar Gurung, a Bhutan community leader, says his people have great difficulty overcoming language-cultural barriers and finding employment. He says these struggles cause a disproportionate percentage of Bhutanese-Americans to suffer mental health problems such as depression. The language-cultural divide is a serious barrier for newcomers, say local refugee and immigrant leaders. Clashing cultural norms of child-rearing practices and spousal relationships cause conflicts and sometimes leads to arrests. Finding decent affordable housing is also an issue. Many go months before starting a job, while studying to become proficient enough in English to be interview and work-ready. Those finding employment often work two or more jobs to try and make it. Omaha’s spotty public transportation system poses problems, leaders say, for individuals working overnight shifts in industrial areas where buses don’t run off-hours. Leaders say some newcomers cannot feed their children, cover rent and pay bills on the temporary state allotment provided refugees. “They’re really struggling,” says International Center of the Heartland & Refugee Services director Maggie Kalkowski. Newcomers still requiring aid after six to eight months are referred to agencies like ICH, an arm of Lutheran Family Services. The situation just got tougher for some due to the state ceasing welfare assistance to legal, noncitizen immigrant adults. Parents depend on the aid to help support their family households. Aid to children is not affected by the cut. Goak says some refugees exhaust public aid limits before achieving self-sufficiency. No one, he says, wants new arrivals to become a chronic community burden, but he feels aid should be extended as needed. Local pantries, Goodwill, Salvation Army, Heart Ministry Center and like agencies pick up the slack for those who fall through the cracks. In good times or bad, assimilation is hard. It’s that much harder for illiterate individuals. Kudlacz says new arrivals here benefit from solid support provided by two main resettlement agencies: SSC and Lutheran Family Services. Catholic Charities’ Lincoln office does resettlement and its Omaha office offers legal and additional services. Ethnic communities themselves also provide educational and other support. “Omaha has not only helpful organizations but strong ethnic groups that provide cultural support and integration,” she says. “In my community, when you speak English they depend on you,” says Thein Soe, a local Burmese community leader and LFS caseworker. “I think that advocacy is an important part of the work we do,” says Kalkowski. 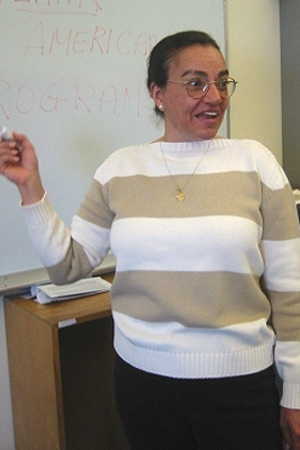 Refugee service organizations provide English as a Second Language classes, legal assistance, micro business programs and a myriad of other assistance. Most services are free. Some require a nominal fee. Three of Omaha’s largest and newest refugee groups — from Burma, Bhutan and Somalia — have their own community associations. The same is true of established refugee groups, such as the Sudanese. Using words like “empower” in their mission statements, the groups offer everything from ESL and driving classes to job and life skills training. They also stage activities to help members maintain their native culture. Cultural cohesiveness is important as groups transition to being American while holding on to familiar, touchstone traditions and ways. There’s power in numbers. Thus, each organization serves as a communal network, lifeline and link for newcomers. Each provides a voice for it’s community’s needs. UNO’s Maria Arbelaez says grassroots community organizations often emerge in response to unmet needs. Their formation is an act of self-determination. She cautions that self-contained ethnic enclaves can isolate immigrants from the mainstream and curtail their progress. She says providers must be vigilant reaching out to immigrants and connecting them to services. Kudlacz says collaboration among service providers and ethnic communities happens through the Omaha Refugee Task Force and the Refugee Leadership Academy, whose members identify issues and work together on addressing them. Coming to America as an immigrant is one thing. Arriving as a refugee is another. The assimilation path for both groups is strewn with challenges. But whereas immigrants tend to be more highly educated and with some financial assets, “most refugees arrive with little more than clothing, personal items and legal refugee status documentation,” says Kudlacz. She adds that refugees generally have little education due to the disruption caused by wars or disasters in their homeland or lack of opportunities in camps they get placed from. Lutheran Family Services’ Maggie Kalkowski admires the resilience of those coming here. She surmises today’s new arrivals face a harder road than their predecessors by virtue of the more complex social-government systems and technologies they navigate. “There’s so much more to learn,” she says. “It’s so much more demanding.” America’s bounty, she adds, is a blessing and a curse for new arrivals, who find “overwhelming” all the choices and decisions. One thing that hasn’t changed is new arrivals supporting family members still residing in refugee camps or countries of origin. Then there’s the pressure newcomers feel to be Americanized overnight, though the reality of learning English and everything else is a long process. The cultural enrichment immigrants bring extends beyond food or language. They have something to teach about communal engagement, too.